Israelis concerned above all with defence and security appear to be turning to the right and to Avigdor Lieberman, leader of Israel's ultra-nationalist Israel Beiteinu party, the BBC's Katya Adler reports from Jerusalem. 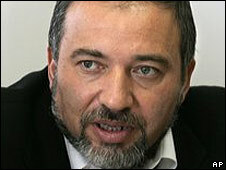 Mr Lieberman is under investigation for fraud, embezzlement and money-laundering, although he denies any wrong-doing. Mr Lieberman looks like he could have stepped straight from one of those 50s B-movies about the American underworld. The ones which feature paunchy middle-aged men in shades with some charisma and a few rather-too-sharp and shiny suits in their wardrobes. I saw him recently at a Jerusalem conference surrounded by fawning aides, a steely, striking, strawberry blonde Russian PA and a host of paparazzi. In his youth, Mr Lieberman was a bouncer outside a Moldovan nightclub. You might then be surprised to hear that one of his political opponents recently described him to me as "Israel's new Jesus". "He's attracting followers left and right," a centrist politician told me. "It's a nightmare for us." So what is Mr Lieberman's appeal? How come when a centre-left government launched an assault on Hamas, hoping to improve its popularity at home in the lead-up to a parliamentary election, the only party to benefit dramatically is Avigdor Lieberman's? "It's simple," my greengrocer told me. "He doesn't believe in being politically correct. "We Israelis are fed-up with terror, fed-up with being told we can get peace with the Palestinians, peace with any of our neighbours in exchange for land. We pull out of Gaza - what happens? We get rockets fired at us. We pull out of southern Lebanon... what do we get? Rockets fired at us. "I don't like Lieberman but at least he has a clear plan. If someone hurts us, bomb them out of existence. None of this listening to international diplomacy rubbish. What a waste of time!" My greengrocer used to vote for Israel's Labour Party. Wherever I go in Israel these days, people who see themselves as liberal and open-minded are espousing views that, to an outsider, sound pretty right-wing. A good friend of mine lives in a wealthy, leafy suburb of Tel Aviv. He is a lifelong supporter of the Meretz party which believes in equal rights for everyone: Jews, Arabs, homosexuals. In socially conservative Israel, it is considered extremely left-wing, but even this party and its followers wholeheartedly supported Israel launching its recent, bloody assault on Gaza. "Enough is enough," my friend Danny told me. "The outside world thinks Israel's army is so powerful, that we overreact against guerrilla Hamas in the south, guerrilla Hezbollah in the north, but they are sponsored by Iran. "We in Israel are being squashed top and bottom by Iran, which has sworn to destroy us. What would you do? You people love to talk of hawks and doves regarding peace negotiations here in Israel. I'm telling you, the doves are dead." Still Danny thought Israel's recent operation in Gaza went over the top. "The civilian suffering there was unbearable," he says, but he points out that most Israelis disagree. "They think the army should have been allowed to finish the job. It's only partly their fault," he told me. "I read the foreign press, but the Israeli media hardly broadcast the images of the devastating impact our army made in Gaza. They concentrated on the fear of Israelis living within range of Hamas' rockets. "For eight years now, don't forget. Older kids wetting their beds. Classrooms, intensive care units in bomb shelters. That's also intolerable, you know." 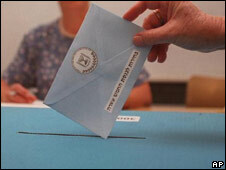 Despite the economy here - as elsewhere - heading into recession, Israelis say security and defence remain their top priorities when they go to the polls. At around the same time, 18-year-old Adi begins her national service in Israel's army. Her mother is a Jerusalemite, her father an immigrant from Latvia. She likes belly-dancing and going to the cinema. "I'm not much interested in politics. Nor are my friends, really," she tells me with a nervous giggle, "but I think Israel has to be tough. We're on our own here. "As a Jew surrounded by other Jews from all over the world in our Jewish State, I feel safe, but when I look outside, I feel our neighbours want to destroy us. People all over the world hate and despise us. I saw that this summer when I went on holiday to Italy with my best friend." Adi has grown up with starry-eyed tales of Israel's founding fathers. "The early Zionists had vision," she tells me, wistfully. "We don't have that anymore. We just need to protect what we have and avoid too many wars. "Peace... I don't think I'll see that in my lifetime." From Our Own Correspondent was broadcast on Thursday, 29 January, 2009 at 1100 GMT on BBC Radio 4. Please check the programme schedules for World Service transmission times.